As a consequence of the recent Typhoon Haiyan (also known as Yolanda), WRF has re-initiated program activities in the Philippines. 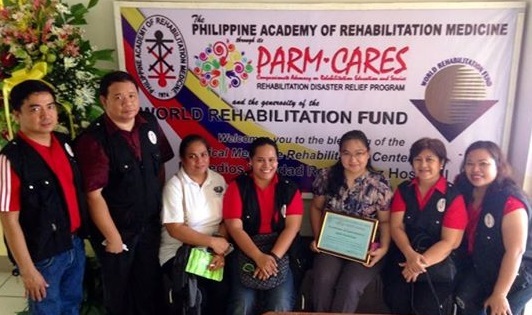 Partnering with the Philippine Academy of Rehabilitation Medicine (PARM) WRF has provided rehabilitation medicine supplies and equipment to three hospitals through its Emergency Assistance Program. In partnership with PARM, WRF identified three most important hospitals affected by the storm in need of assistance in the Tacloban region. These are the Remedios T. Romualdez Medical Center (RTR), the major teaching hospital in the area, Divine Word (DW) Hospital, a major private facility, and Eastern Visayas Regional Medical Center, the major regional public hospital. WRF collaborated with AFYA, a NY-based organization, to procure the donated essential equipment and materials to re-stock the rehabilitation units of the hospitals. The shipment arrived in the Philippines in August and the critical rehabilitation materials and equipment were distributed to the three hospitals. Full services in these units were able to be resumed in October 2014 when an official opening took place at each of the hospitals. As a result of the WRF contribution, some 20-30% more –patients will be able to be served by the three facilities. The typhoon was one of the strongest tropical cyclones ever recorded and was the deadliest Philippine typhoon on record. Over 6300 people were killed and over 1.9 million were made homeless. Most of the most serious effects of the storm took place in the Tacloban area, where all three of the hospitals helped by WRF received major damage. WRF’s involvement in the Philippines goes back some 50 years when WRF inaugurated the first rehabilitation medicine training program in the country at Santo Tomas University. WRF also assisted the Philippines in developing a pioneering project in Community Based Rehabilitation which has served as an international model for such programming.